A parking lot inspection conducted by the Consumer Council Patrol revealed that some parking lots do not abide by the regulation to display quarter hourly parking rates, starting from the second hour. It also revealed that Jerusalem has the country’s highest daily parking rates, Tel Aviv has the highest hourly parking rates, and in half the parking lots the Patrol inspected drivers are forced to pay the same rate for half an hour parking as they would for the whole day. It would appear that Jerusalemites are willing to pay much more for daily parking than drivers in the other major cities. The average rate for daily parking in Jerusalem is NIS 58.44, almost 60 shekels! A special inspection conducted by the Consumer Council Patrol revealed that the daily parking rates which parking lot owners charge drivers for a one-time entrance are 38% higher in Jerusalem than rates for the same daily parking in Tel Aviv, Be’er Sheva and Haifa. 3. Is there a sign displaying rates? 4. Is the rate for a quarter of an hour displayed? According to Article 70b1: (a) The parking lot operator, regardless of whether or not he is the parking lot owner, shall charge for every 15 minutes of parking ; the provision of this subsection shall apply from the end of the first hour of parking. Clause b: There is nothing in the provisions of subsection (a) that prevents parking charges for a day, a week or a month, on a permanent or a one-time basis. The Consumer Council Patrol found that Tel Aviv charged the highest rate in the country for the first hour of parking. The rate for an hour of parking in Tel Aviv was an average of NIS 15.86. After that, in descending order: Jerusalem (an average of NIS 14.22), Haifa (an average of 11.44), Herzliya (NIS 11) and Be’er Sheva (NIS 11). 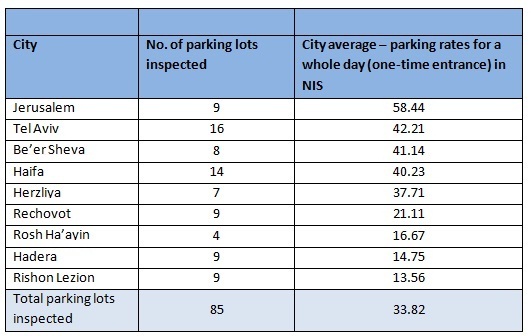 The following are the results of the average rate for the first hour of parking in different cities, from the highest to the lowest rate. After examining all the parking lots that were inspected across the country, it was found that 19% of them had no signs at all displaying rates, while 81% did display rates. Where you will park for an hour and pay for a full day? 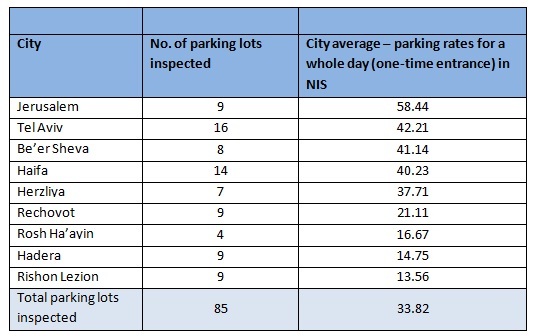 43 parking lots (out of 85 inspected) displayed a one-time rate only, with no hourly rate. Israel Consumer Council CEO, Adv. Ehud Peleg: “A daily parking rate is actually one of the ways that parking lot owners charge a high one-time parking fee to drivers who need their services. The lack of parking spaces forces the public in the big cities to use parking lots, whose high fee is a kind of cynical exploitation of the drivers’ predicament. This particularly outrages the Consumer Council which is promoting legislation that obligates parking lot owners to display an hourly parking rate alongside a one-time entrance rate.